We started visiting Vienna in December 1999 and in 2000 we stayed at the Hilton Vienna Plaza for the first time. The reason for choosing the hotel was because it was so close to the fabulous Christmas market at the Rathaus. We fell in love with the hotel on that first visit and we’ve stayed there every time we’ve visited Vienna since. After our Club Europe flight from Heathrow, we collected our cases and headed to the taxi desks. You can go straight to the taxi rank, but most of them don’t accept cards in the car. 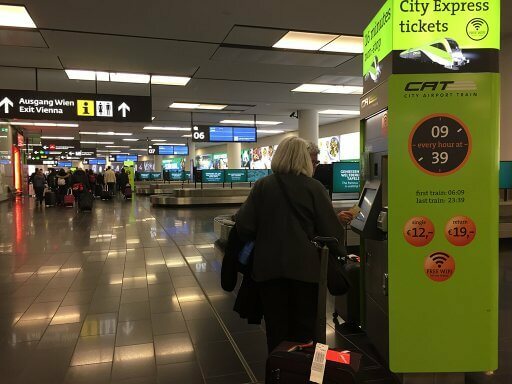 By going to the taxi service desks, you can pay with a card at the desk. Then the driver will take you to his car. The taxi fare is fixed from the airport to central Vienna, so it doesn’t matter which company you use. However, at the desk, they give you a 10% discount voucher for a return journey. The airport is to the south-east of the city and it’s a straight run from there into central Vienna. On a normal day, it takes about 20 minutes from terminal to hotel, however we hit some heavy traffic, so it took us a little bit longer. 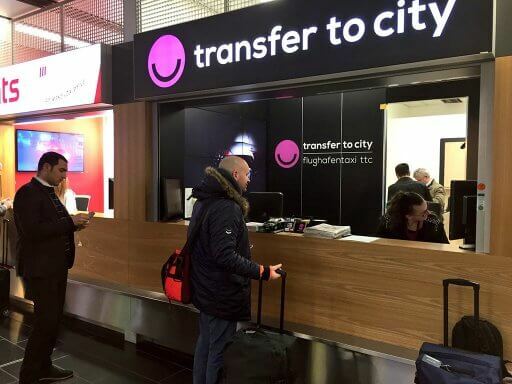 You can also transfer to the city by bus or by the CAT, the City Airport Train. Both these options are cheaper than a taxi, however, they both take longer and we were keen to get stuck into our four and a bit days in Vienna. The journey from the airport to the Hilton Vienna Plaza is not the most thrilling one. However, as we drew closer, the excitement started to build. I had to contain my inner child voice to stop asking “are we there yet?” over and over. Finally, big internal cheers as we hit the corner of Schottenring, directly opposite the hotel. Then, it was frustration as we just missed the traffic lights and had to wait before we could do that last 80 metres to the front door. After what felt like an eternity (which in reality was only about a minute) we pulled up in front of the doors of the hotel. A welcome sight, though it is not quite as welcoming as it used to be. When we first started staying there, the hotel had a huge concierge desk, a doorman and a small army of porters. 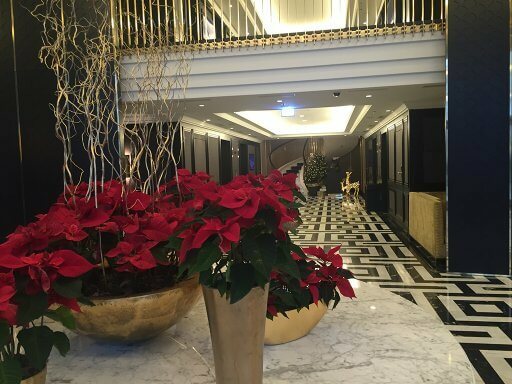 As soon as your taxi pulled up outside, the doorman would open your taxi door and welcome you to the hotel. Then porters would appear to take your luggage to the reception for you. In 2014 the hotel closed its doors for a refurbishment. When it re-opened nine months later, the concierge desk had gone, along with most of the porters and the doorman. 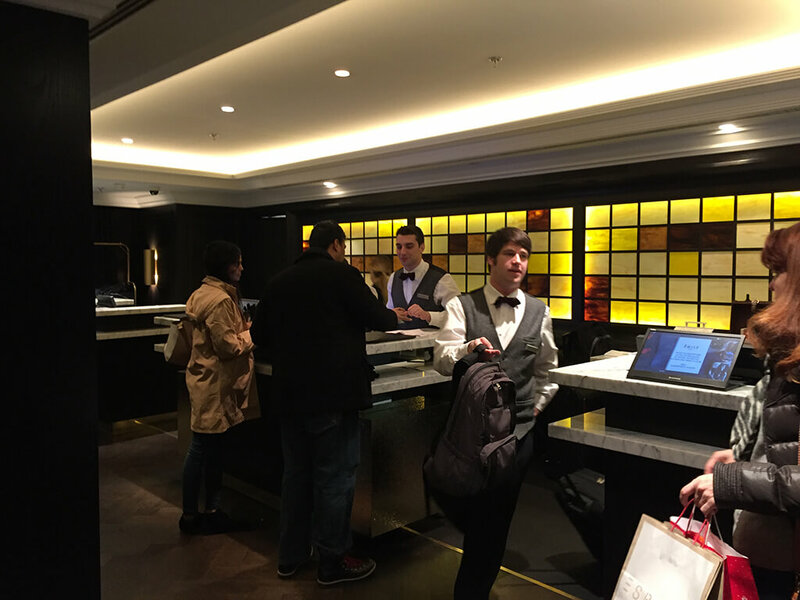 I suppose it could be claimed that it’s moving with the times, but we miss that every year the doorman would recognise us and with a friendly smile say “Nice to see you back again gentlemen”. 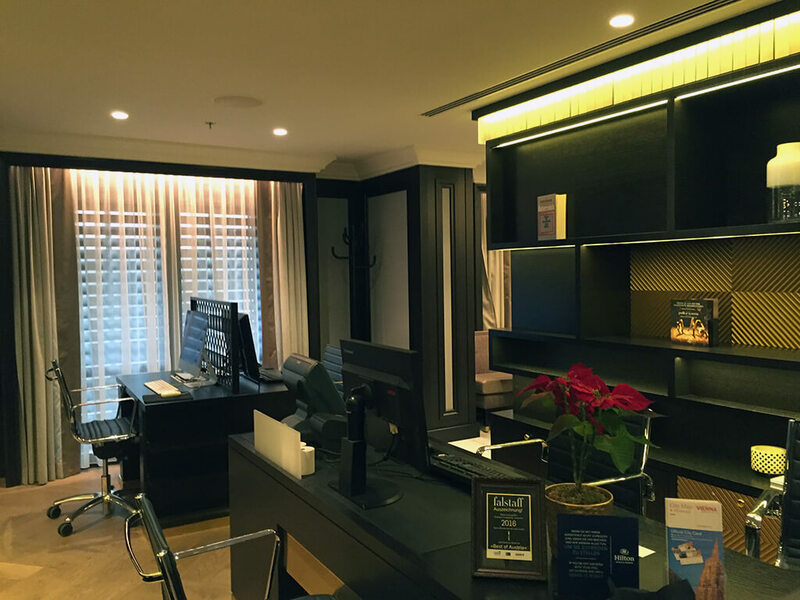 If it’s your first visit to the Hilton Vienna Plaza, you could be forgiven for not noticing the reception desk. 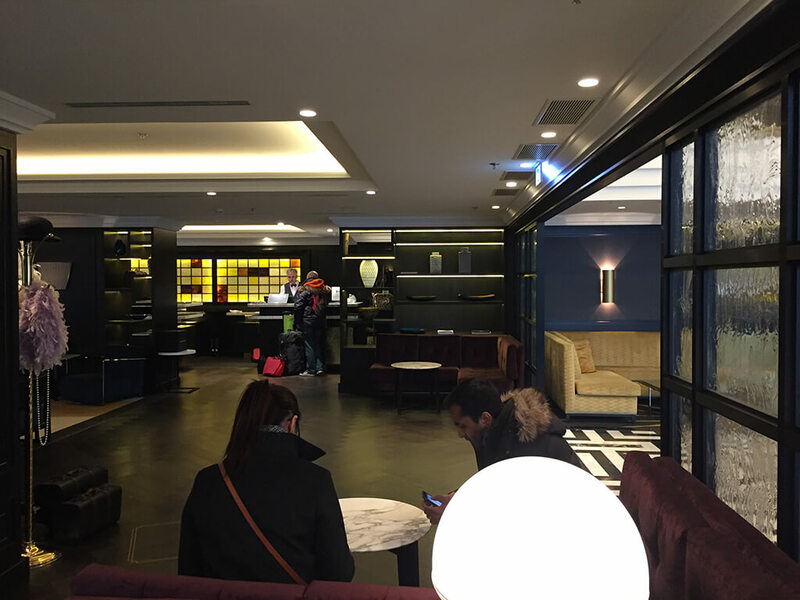 In the 2014 refurb they created a little lounge on one side of the lobby. It’s quite a nice little area, with comfy seating, a TV and iMacs. However, to create it they moved the reception desk and front office into a space that was a function room. What that means is that you can’t really see it at first as there are two great big pillars in the way. The reception was fairly busy when we arrived, so we had to wait a couple of minutes before we could check in. After saying hello and Bart saying we had a reservation, the guy checking us in asked if it was our first time in Vienna. Fighting back the urge to say, “well, you’re looking at the reservation, what does it say in in the customer history?”, we told him that we had been many times. 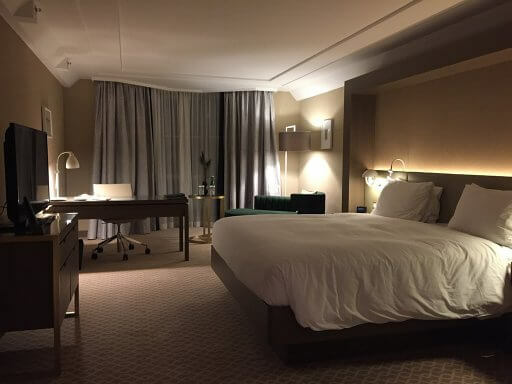 He went through the check in process and then said “I see that you are a Hilton Honours Gold member and so we have given you an upgrade to an Executive Plaza Room”. It’s the same room as regular Executive Room, but on a higher floor, with “better view”. He handed us our key cards and directed us to the lifts. what he didn’t do was explain that we had access to the Executive Lounge, where the lounge was located or anything about its opening times. It didn’t matter much, as regular visitors to the hotel we know where it is, the opening times and what’s on offer when. 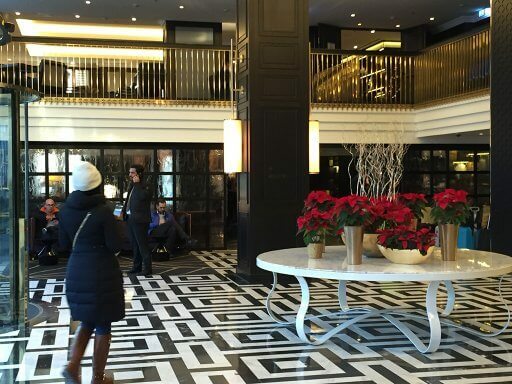 We headed across the lobby to the lifts. Being the festive season, the lobby was looking very Christmassy with the centrepiece being a huge display of poinsettias. They looked lovely, but we miss the huge Christmas tree that held centre stage every year until the refurb. The lifts at the Hilton Vienna Plaza are operated by touching your room card on the reader. This was something that baffled the guests that took the same lift as us. Arriving at the 8th floor, we made our way to room 810; our home for the next 4 nights. 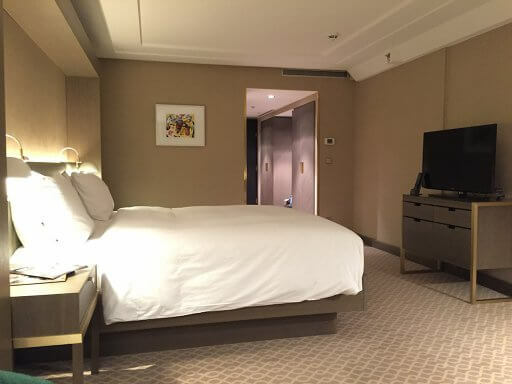 According to the room description on the Hilton website, you can “take in the view from the 8th and 9th floors of the hotel in this King Plaza Executive Room”. What they don’t say is that the surrounding buildings are also all about 10 storeys high. So, if you aren’t in the rooms along the front of the hotel, you have a fantastic view of the building next door. All the windows have a bay, and if you go to stand in the bay, you do get a great view across the city. Looking straight ahead from room 810 you have a fantastic view straight into the offices at the police headquarters. The room itself was great. One of our niggles prior to the 2014 makeover was that the rooms looked a little dated. The rooms are now fresh and clean. The furniture is modern, with a rich, dark colour, which works well with the light colour scheme of the room. 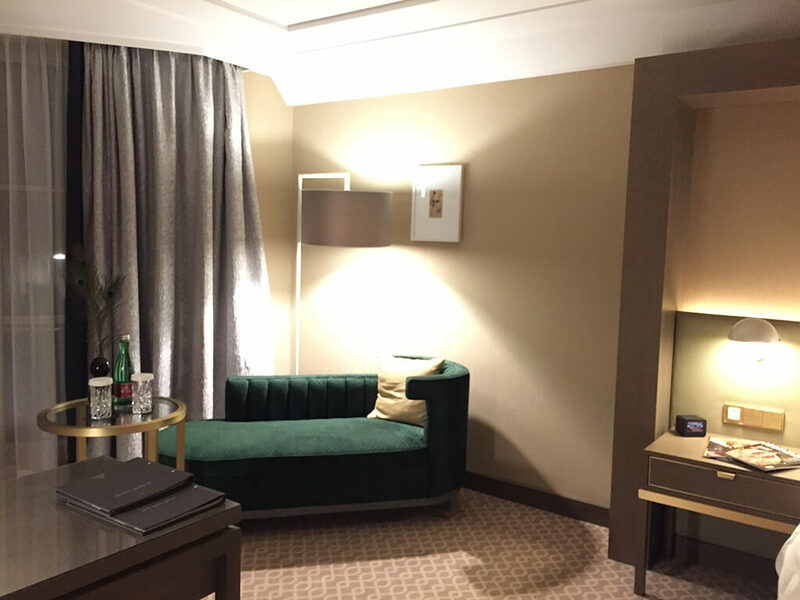 The Hilton Vienna Plaza has three different types of Executive room. These are The King Executive Room, The Executive Plaza Room (available as a King or Twin) and the King Penthouse Executive Room. The Executive Plaza rooms are located on the 8th and 9th Floor, while the King Penthouse Executive Rooms are on the 10th. The King Penthouse Executive Rooms are also bigger and have a balcony. 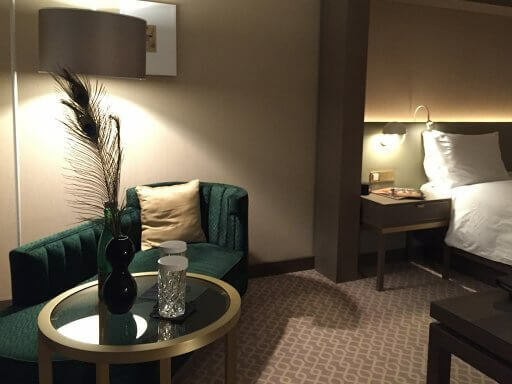 All the exec rooms are a bit bigger than the standard room, but the real advantage of paying for an exec room is the executive lounge access that is included in the rate. The exec floor toiletries, fluffy bathrobes and slippers are all very nice but don’t add much value to your stay. As I said before, the hotel underwent extensive refurbishment in 2014. The refurbished rooms are modern and elegant. The dark wood of the furnishings compliments the pale colours of the paint and wallpaper. 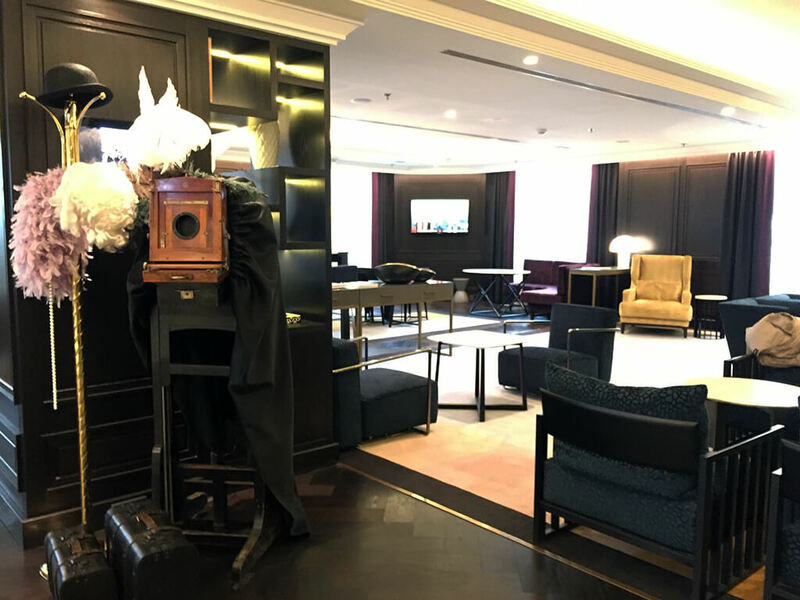 The hotel is renowned for having over 1,000 original works of art and most of the rooms seem to have at least two original drawings or paintings. This helps to individualise the rooms, as while all the rooms are similar, no two are exactly the same. The bed in our room was a super king, which was very comfortable. There were extra pillows and an extra duvet in the wardrobe if you needed them. As well as the bed, there was a writing desk and a chaise lounge, which was comfortable enough for Bart to nod off on a few times while he was sitting on it. There is also a large 42 inch LED TV and all rooms have WiFi access. Our only gripe about the room is one that we frequently have – the number and position of the plug sockets. As the digital age had well and truly arrived by the time they refurbed the hotel, you would have thought the design would have taken people’s tech into account when designing the rooms. They did have the good sense to put a socket on each bedside unit. Apart from that, there are just two sockets in the desk. With all those sockets taken up by charging devices, there would be nowhere to heat up your curling tongs. Also, all the plugs are European 220v, whereas, in other refurbished Hiltons, they have added US and UK sockets. 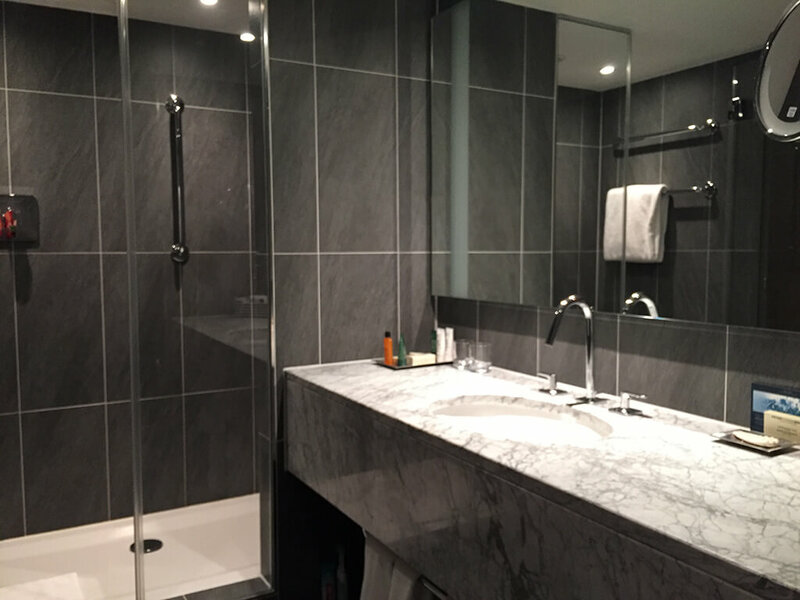 One of the biggest changes within the rooms was the upgrade of the bathrooms. Back in the day, all the rooms had a bath with over-bath shower. 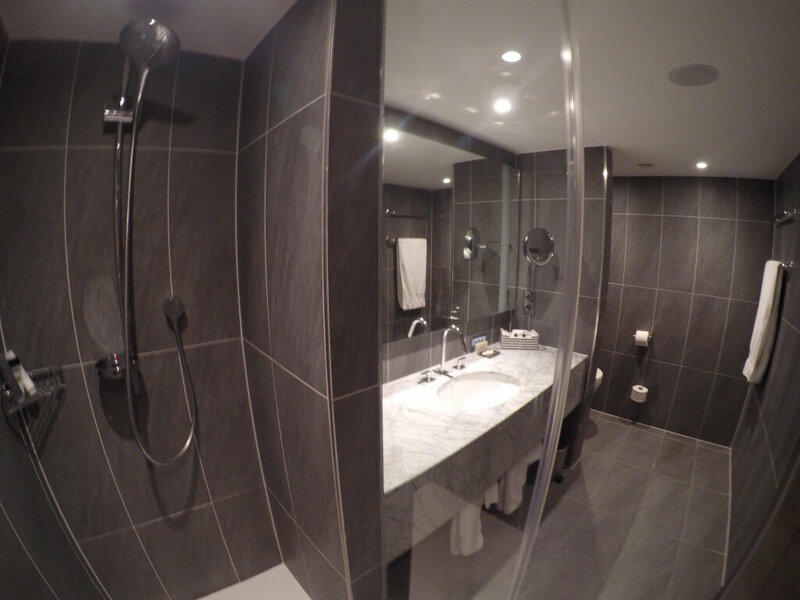 In the refurbishment, the baths were ripped out and replaced with fantastic large walk-in showers. The showers at the Hilton Vienna Plaza also have fantastic water pressure. There have been some gripes on review sites about the lack of baths. However, I don’t think it’s a big deal that there is no bath. After all, It’s so rare that I want to have a bath and when we’re travelling we tend to want to get up and go. A walk-in shower is much easier than faffing around, fighting with shower curtains that won’t stay put. And then with over-bath showers in hotel rooms, you always seem to end up with a gap and a flooded bathroom floor. No, when I’m travelling, I’ll take a nice powerful walk-in shower any day. The thing that makes Executive rooms good value is the access to the Executive Lounge. 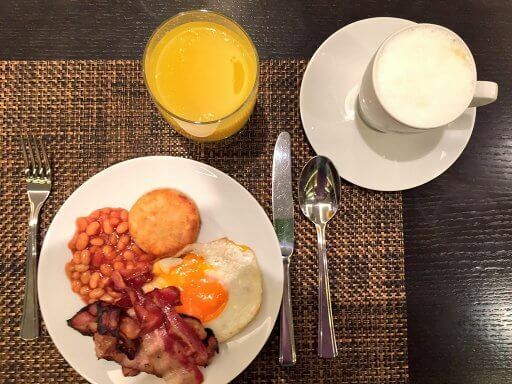 Although the exact offerings vary from hotel to hotel, as a minimum you will get breakfast in the lounge. 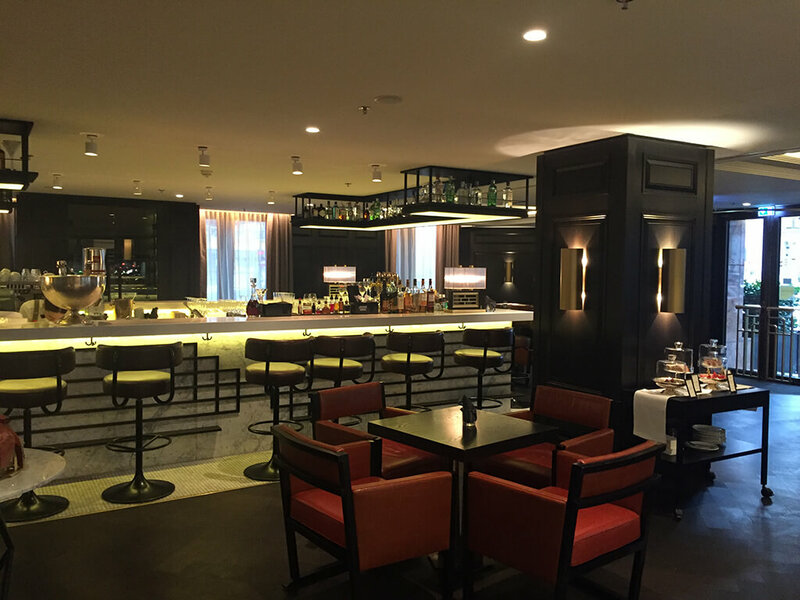 The Lounge at Hilton Vienna Plaza is on the first floor, overlooking the lobby. 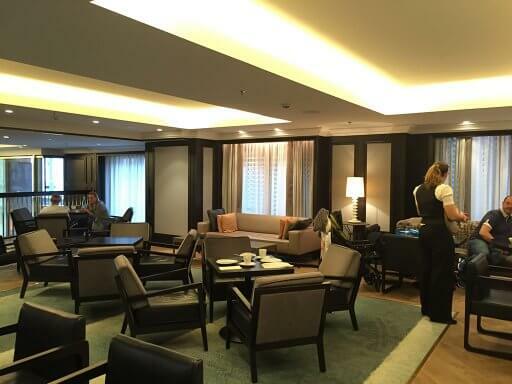 It’s a fairly big lounge made up of three sections. There’s a lounge seating area, a small reception area and an area with food & drink counters and tables. The lounge area has sofas and bonket seating, as well as a large TV. The reception area of the lounge has two computers (one PC and one iMac). The lounge offers a good selection for breakfast, though not as much choice as the breakfast in the restaurant. The weekend we were there, the hotel was quite busy and the Executive Lounge was fairly full when we arrived there on the first morning. However, it all seemed to be under control and well stocked. We both opted for a hot breakfast on the first day. The hot selection included bacon, sausages, hash browns, baked beans, mushrooms, tomatoes, scrambled egg and fried egg. It was all hot and very tasty. 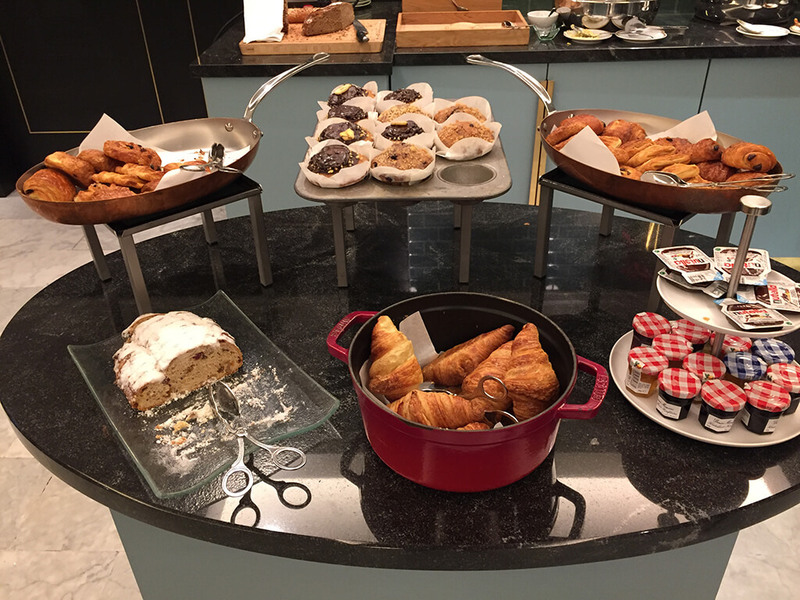 We followed up with some pastries and were set up for the day. After a great breakfast on Friday morning, we headed to the lounge on Saturday morning with high hopes. Boy, were we disappointed. Walking into the lounge we were greeted by a room that looked like a bomb site. The free tables were piled with dirty dishes and I would say that the majority of guests in there looked decidedly unhappy. We spotted two places that were set up for breakfast at the end of a large table, so we nabbed those and went up to the buffet. To say that it was badly stocked is an understatement. The cold selection had only a few slices of ham and a couple of bits of cheese. The hot selection wasn’t much better – the scrambled egg that was there was a solid lump that looked as though it had seen better days. The pastry section consisted mostly of empty plates. As I picked up some bacon, I heard a guy complaining to one the staff that the coffee machine had no milk and no coffee in it. Meanwhile, Bart asked another one of the staff if they could bring out more fried eggs as there were none left. She just said “oh” and walked off to the kitchen. She reappeared a few minutes later and went off to clear tables. What she didn’t do was apologise or come back to Bart to say they were on the way. After nearly 10 minutes, there was still no sign of the eggs, so Bart flagged her down again to see what was going on. Her response was “I have asked for them”, but the attitude was “like I give a s**t”. Bart decided that rather than just sit there and fume, he would contact guest services and complain. However, as an extra measure, he decided to tweet Hilton Honors about the issue. Before we had even finished eating and had the chance to speak to guest services, they had replied to the tweet. They asked Bart to DM them with his Honours number and room number and they would share his concerns with management. After breakfast, we went back to out room to get ready to go out for the day. We had been back in the room for few minutes when the phone rang. It was the guest services manager, who had called to apologise; a rapid response that we were both really pleased with. When we were ready, we headed out for the day, returning late evening to freshen up before heading back out for dinner. 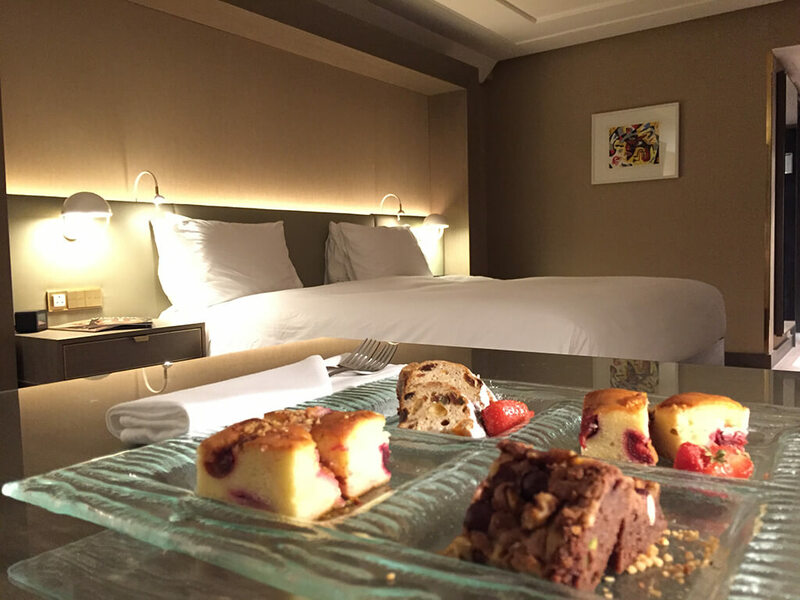 When we arrived back at our room we found a lovely a plate of sweet treats and an apology from the hotel’s manager. It was great that they had apologised and the yummy sweet treats were a very nice gesture. The next day, the lounge was equally as busy as on Saturday but was clearly much more organised. 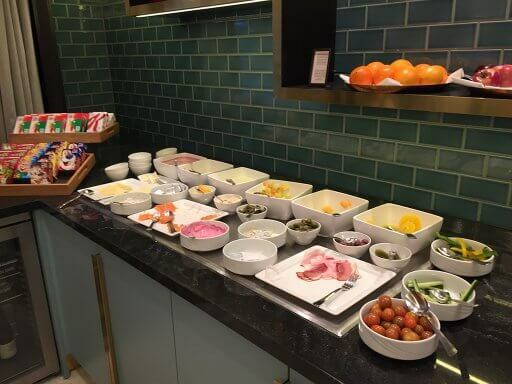 There was an obvious management presence in the lounge and the staff were managing to keep on top of restocking the buffet and clearing the tables. It was quite a relief and we were glad to see things back to the standard we have come to expect. 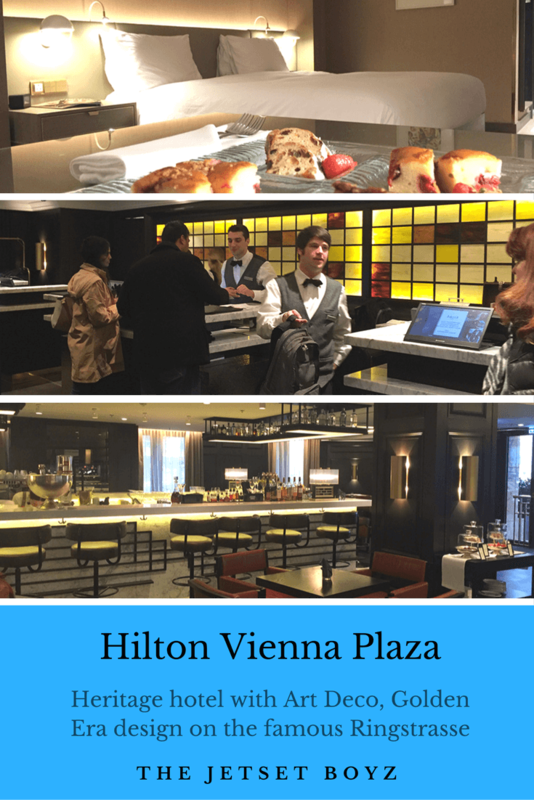 There are two dining options at the Hilton Vienna Plaza; 24 in-room dining or the restaurant. When the hotel was remodelled in 2014, the bar and restaurant were redeveloped into the French-style Brasserie and Bar Émile. We hadn’t tried Émile on previous visits, but this time we decided to give it a go on Friday evening. 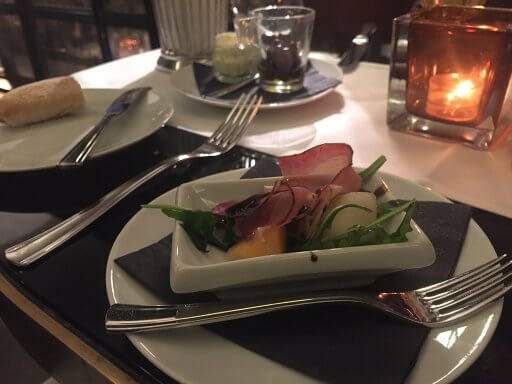 In previous years we hadn’t been wowed by Émile’s menu. However, the offering seems to have improved and this time we found that there were a few good options. 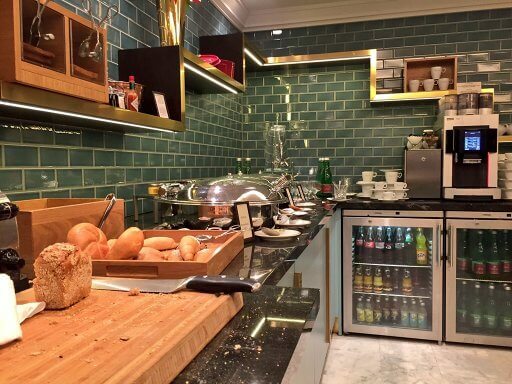 They serve a mixture of French inspired and classic Austrian dishes. 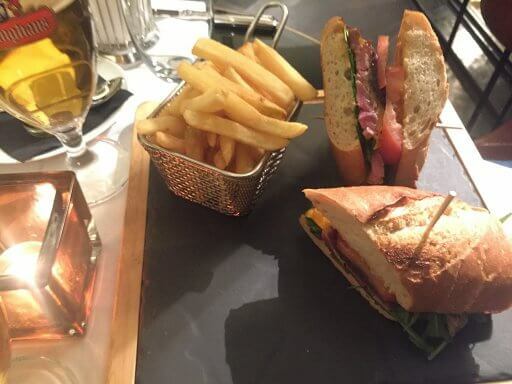 After being seated reasonably quickly, I decided to go for the Steak Sandwich with onion confit, served with fries. 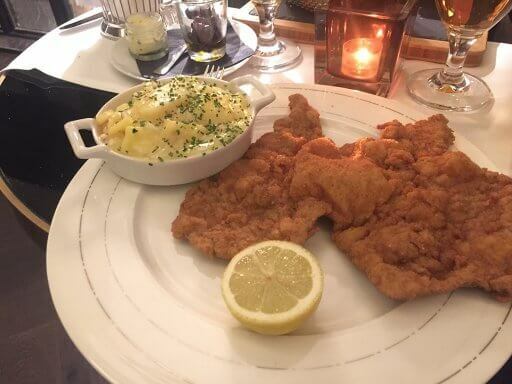 Bart, on the other hand, went down the traditional Austrian route and had Wiener Schnitzel with potato salad. They have a pretty extensive cocktail menu and a large wine list too. 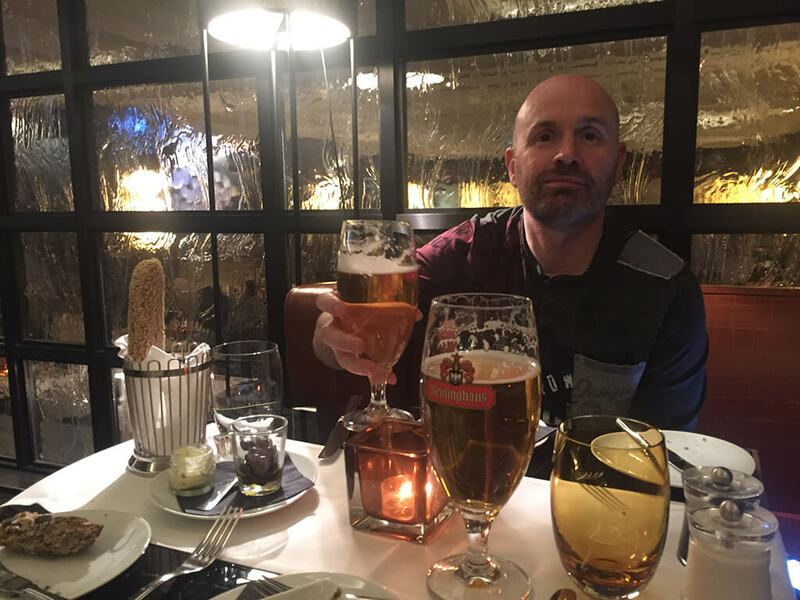 However, we were more in a beer mood, so chose draft Reininghaus Pils, a golden Austrian lager with spicy flavour. Shortly after ordering, the beers arrived, followed by some lovely fresh bread with olives. Then they also brought us complimentary appetisers of smoked ham and melon salads, which were really tasty. After a short time, our food arrived. The portions were quite generous and both dishes tasted fantastic. 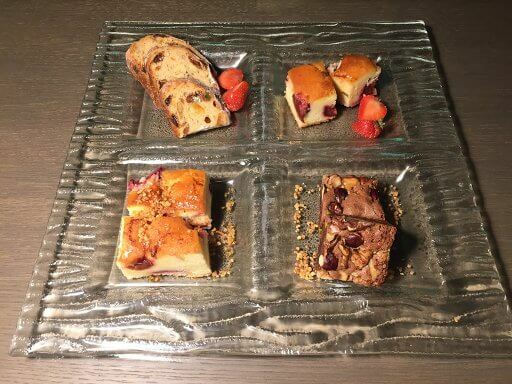 The meals were pretty filling, so consequently, we decided to skip dessert, though the Chocolate Variation looked very tempting! Our trips to Vienna always seem to fly by a little too quickly. Before we knew it, it was Monday morning and time to check out. Monday’s breakfast was a calm and quiet one in the lounge. Afterwards, we realised that on this visit we had hardly used the lounge apart from having breakfast. In past visits, we had popped back to the hotel to enjoy the complimentary afternoon coffee & cakes and evening drinks & canapes. Check out was hassle free, with the reception being quiet. We stored our bags and headed out for the last visit to the Christmas Market at Rathaus Park. Popping back briefly to collect our luggage, we reminisced about the days when taxis would often be lined up just down the road, waiting to be summoned by the doorman’s whistle. These days we call our cab on the mytaxi app. Even though there were some issues at breakfast on Saturday, we had enjoyed our stay. 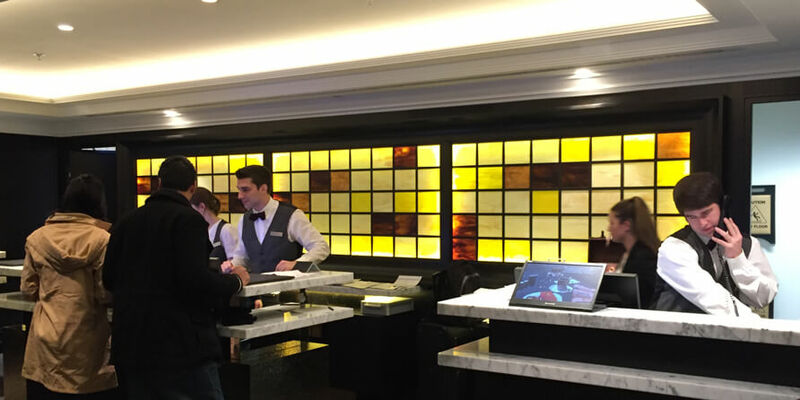 There are a few things that we miss from the pre-refurb days, but overall, the updated facilities more than outweigh those. It is a lovely hotel and for us, it is in the perfect location. 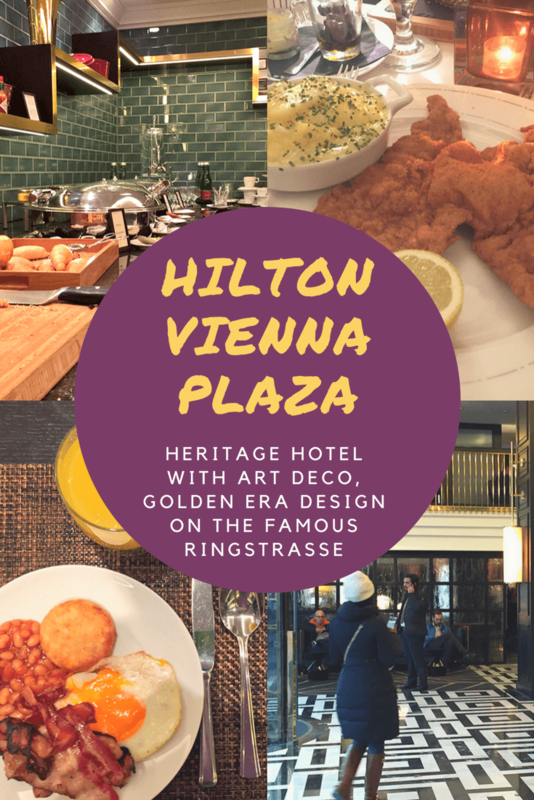 For these reasons, the Hilton Vienna Plaza is the Jetset Boyz hotel of choice for our trips to Vienna.